If you are a hair stylist or a barber, you know that talking about your shears is an endless story. Your professional hair cutting shears are versatile (so that you can give it a go with all sorts of hair styles) and let you try various effects throughout one single haircut. Another great thing about the hair cutting shears is that they come in a variety of sizes and each one of them has their efficiency. They all seem to matter when you love your hair cutting and you might get addicted at some point, for sure. High quality cutting shears come with a price but as long as you see it as an investment for a life time, you’re good to go. You only need to take good care of them and spare them from the useless jobs. No hair dresser/barber can do a great job on cutting if he has the wrong tool. The hair cutting shears become an extension of his talented hands and choosing the right shears is not that easy at may seem for the unexperienced shopper. 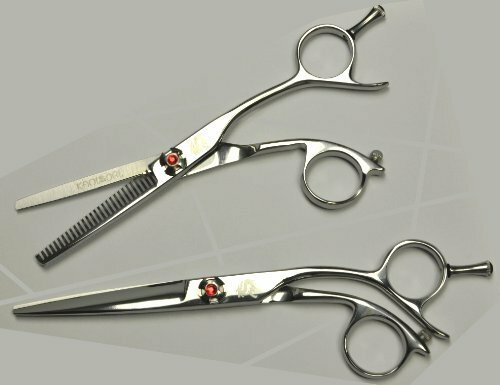 Most of the professional hair cutting shears are made of stainless steel, which is typically made in Korea, Japan, Germany, India, Pakistan or Taiwan. From all of these countries though, it’s the Japanese steel that stands out the most with the highest quality, whereas India and Pakistan offer the lower quality on the steel. No matter the quality though, keep in mind you need to take good care of your shears as stainless steel is not stain proof. Best hair cutting shears are hand-forged and give a much sharper edge. The less you pay, the more likely your shears to have some drag on the blade. Most of the hair cutting shears out there feature an even hollow-grinding on the inner surface of the blade. If some low priced shears feature thick beveled edge, most shears come with a convex edge so the hair stylists get better flow on the cutting. It’s always better to measure the length of the blade against your middle finger and the entire length of the shears against the palm of your hand. Most of the hair cutting shears are somewhere between 4.5” and 8”. If you are left-handed, it’s better to get shears specially made for use so that you don’t put too much pressure on your hands. The shears made for the left-handed feature the sharp edge of the top blade on the left-hand side of the blade. Check to see that your hair cutting shears are not loose nor sloppy, as this may attract more pressure on your hand. To minimize the size of the finger holes, you can get some help from plastic inserts. Nowadays you may have “ergonomic” shears that are designed to lower the pressure on hands, arms. You can use the shears for longer time, with less fatigue. 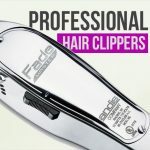 Best professional hair cutting shears reviews talk about how many sizes are for the hair cutting shears. Smaller ones give great help for a tailored shape, whereas longer one’s work in some specific techniques. Some like to work faster, some want to cut slower, with more attention on the details. But, if you are a hair dresser, it’s very likely you already have several sizes of hair cutting shears by now. No matter your final choice, always clean up your shears with a damp towel or cloth on regular basis before storage them. Wipe the blades with alcohol if you used it for permed or colored hair. It’s a good thing to oil your shears once a week and keep them in a case when not in use. get them serviced once a year- this means cleaning, setting and balancing. Taking care of your shears now means having them in the next years to come also. When you are in the hair cutting business, you know that professional hair cutting shears come with the price. This is why, the Kasho Design Master Series Offset 5.5″ might be a nice surprise as, for the money you pay, you get a reliable and long lasting tool for your haircutting. The shears feature a comfortable offset handle so that you gain speed and easiness when cutting. 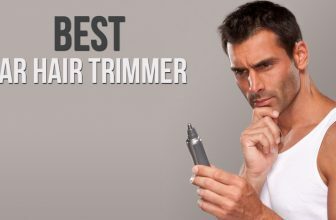 The shears feature razor sharp semi-convex edge, which gives you the chance to try all sorts of hair styles. The shears are very sharp and you can use them on daily basis for long time until they need sharpening again. The shears have the right weight and they feel comfortable and well balanced in your hand. The ratchet screw system lets you get the right tension, just the way you like it. The hollow ground blade takes off the weight from the shears. The shears are finger adjustable and the finger rest is removable. 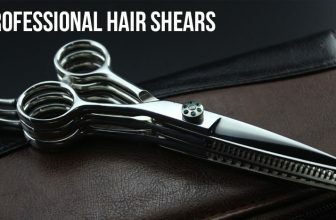 The shears are made in Japan, out of the highest quality stainless steel. they are built to last for a very long time. 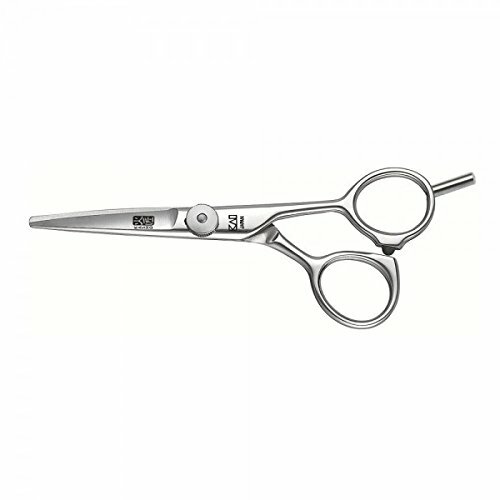 The shears have a satin finish and look sleek and elegant. They come also in left-handed models. The satin-finish blades are the final touch. All in all, for the money you pay, the shears are a great choice for any professional in hair cutting business. Featuring a crane handle design, the Sam Villa 6436 Signature Series Wet Cutting Shear Scissors, 6.25 come with many good qualities. The shears present Teflon liners in the ride zone, which are more for the looks than for the functions. The shears are quite sharp and remain so for quite some time. As they have a specific design, you might get your thumb into the spine of the still blade at least for one time. But there is minimum move of the thumb when using the shears. The steel used on the shears is molybdenum alloy, which is a steel that feels softer than other steel and doesn’t loosen that easily. The shears sit on the big and heavy weight side, but some like it this way. The design of the handles is well thought out and you get control if you want to open the tips of the shears only a little bit. You can actually use the shears with thumb ring when cutting away from you. The shears are sharp and give great power in the tips. They make a great choice for the thicker hair and large sections. They feature a full convex edge and the hollow grind is quite deep. Due to their length and weight, the shears work great for scissors over the comb cuts. The offset handles give width to the blades, so this is why it’s easier to go over with comb. Some use the shears for the dry hair and when cutting most of a haircut. 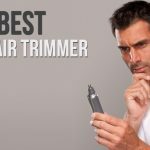 All in all, as they bring efficiency on the thick hair and reliability in many haircuts, the shears are good options for the professional hair stylist. Even though they might look smaller than you’d expect, the Kasho / Kai Silver Series Offset 6.0″ are truly lightweight and delicate. The shears give a great smooth feeling in the hand and this is specific note of all Kasho shears. The shears are very sharp and it’s better not to use them on dry hair as they are too tough for it. If you’re not paying attention, the shears may grab and skin the cuticle. Don’t think that the sharpness goes away in time, as the shears remain very sharp even after several months of use, which is a great thing. The shears are very accurate and a perfect tool for the details and “precision cutting. They work better on thinner hair and you need to go through thinner sections when working on thick hair. The shears are very well made and feature tension screw that uses 2 prolonger key for better adjustment. When using the shears, they don’t collect very much hair as they are so smooth, giving less space for hair to get stuck in. the shears are well thought out and this high quality engineering. The design of the handle is “imho”, which gives an amazing grip and a nice feel when holding it. The edge is convex and the shears are greatly crafted. The soft polished finish, the small hone line, the hollow ground that is shallow- all of these are great details that count so much. Despite the minor cons, the shears make a great, lightweight, high quality option as professional hair cutting shears. 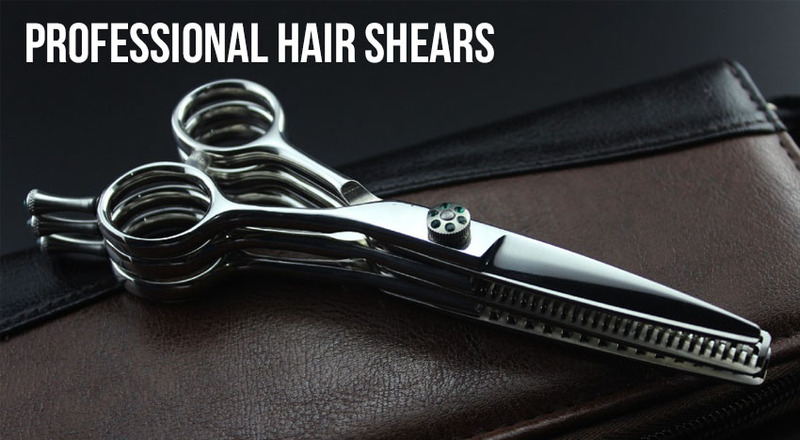 If you are truly dedicated to your hair cutting passion, then you know that the high-end shears are not only amazing by performance, but also build to last for more than one generation. A very good example is the Kasho / Kai Green Series Righty Semi Offset 5.5″ is not only made with Japanese high quality materials. The shears feature a crane handle which gives comfortable and reliable grip. The shears are well balanced and may be used for hours with minimum hand stress. The tension adjustable screw gives you the option to find the best setting on the shears. The integrated ball bearing is both functional and efficient. The shears have an ergonomic design that is thought out so the fatigue is minimizes. The camel back and the removable finger rest are important details just as well. The convex blades are mirror polishes so the shears are very sharp, for a very long time. The shears really address to the experienced hair stylist that knows how to handle it in order to get not only the best haircut, but also the highest performance from the shears. Apart from the price, we have no cons. We think they are a very good investment of your money as you only do it once in your lifetime. Even though it might look pricey (to say the least) to some, the passionate hair stylists sure appreciate the high quality and sharpness that the Kamisori Dm-1 Emerald Professional Hair Shears. The shears truly fit the description of ultimate professional shears. They are made from the finest Damascus steel. they are made to last forever, no matter the heavy use in a hair salon. The shears are very sharp and you don’t need to sharpen them often, no matter how much you use them on regular basis. The shears may be used on point/blunt/wet/dry /slice and give great performance in so many hair styles. The offset handle is highly comfortable and the shears feel nice in the hand. They have a good weight and are perfectly balanced. They slide easily through the thickest hair and don’t collect much hair. they are silent and help you work smoothly. The shears are well thought out so that there is minimum pressure on your hands when cutting. The craftsmanship of the shears is amazing and they are made to last. Apart from the price, we have no cons and we think they are truly for the devoted hair stylist. Finding some high quality professional hair cutting shears, for a very good price, it’s not that impossible, but only a little bit challenging. The Kamisori K2055 Professional Hair Shears, Black Diamond sure fit not only a fair bill, but also the high expectations you’d have from some professional hair cutting shears. The shears are made of high-quality Cobalt steel which means not only better performance, but also longer lifespan for the tools. The shears are designed and handcrafted for the heavy duty jobs in a hair salon, for a very long time. The crane handle makes the grip comfortable and sturdy. The shears sit nicely in your hand and the pressure is minimum so that you can use them an entire day with little hand tiredness. 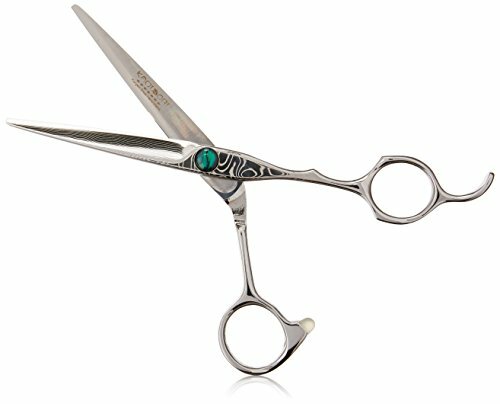 The shears are highly versatile and you can use them to glide, blunt on dry and wet hair at the same time, no matter the hair cutting technique you chosen. The shears are sharp and remain that way for a long time. when not in use, you can expand their life span and protect them in the elegant case that comes along. As the cons are too minor to count on our part, the shears give high quality performance and a fair price, at the same time. When you want high quality hair cutting shears, but can’t afford the real deal, you still have a chance to use some of the best options out there with the Kasho / Kai Balance Precision Series Offset 5.5″. The hair cutting shears bring the high quality of the Japanese materials and craftsmanship for a very good price. The shears feature an ergonomic offset handle that is not only comfortable, but also great for extend use with minimum hand tiredness. The shears have razor sharp semi-convex edge. They are very sharp, for a very long time and give you the chance to try so many hair cutting styles. The shears make the perfect choice for everyday cutting and fit the needs of any beginner, but also of the professional hair stylist also. The shears have a good balance and leave a nice feel in the hands. They have just the right weight and look very nice. The modern matte finish is not only great, but also protects the shears for the long run. All in all, for a very good price, you get reliable, sharp and long lasting professional hair cutting shears. There are many hair shears brands out there, but it seems that Japanese have found the key when it comes to high performance and high quality materials. A good example is Kamisori and we present this time Kamisori Black Diamond Hair Scissors Set. The shears are made of V-10 Cobalt and are part of the Dragon Collection. The shears are very sharp and leave a comfortable feel in the hand. They are built to last forever and make a great choice for slice, blunt and point cutting. you can also buy the shears separately. The crane handles mean comfortable and good grip and minimum hand fatigue, even after hours of using. The stress in the wrist and shoulder is lowered just as well. You can use the shears for cutting and texturizing for a long time before needing to sharpen them. 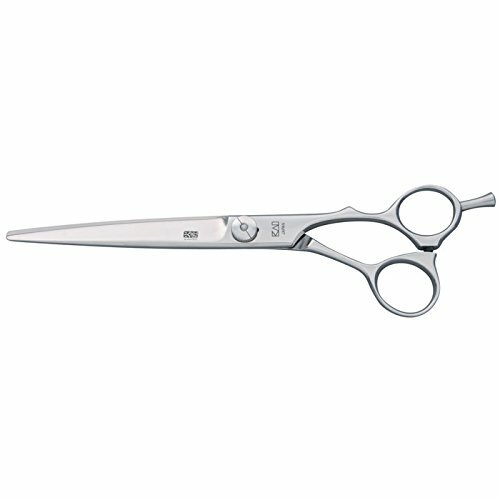 Another great professional hair cutting shears brand is KASHO and another very good example for their quality and performance is the Kasho / Kai Damascus Series Offset Righty 6.0″. Hand forged and finished, the shears meet not only the highest quality standards when it comes to materials, but also those related to the craftsmanship. 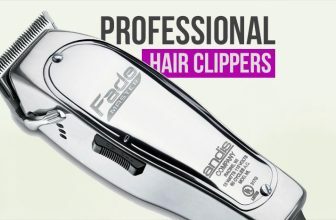 The shears are made of V10 Premium steel alloy so they are not only lightweight, but also very durable and ready to take the heavy duty jobs in a professional hair salon. The shears are strong and can take few drops. The Damascus steel is layered on top of V10Steel, giving an amazing patterning. The ergonomic, offset handles brings comfort in the hands and keep at distance fatigue. The pressure in the hands is lowered and so is the tension in the arm and shoulders. The flat screw system includes ball bearing system, creating a soft feel when you open/close the shear. The blade is convex and hollow ground. It’s also polished and mirror sharpened, which is so close to perfection. Sharp for a very long time, incredibly handcrafted, the shears are an obvious choice for the passionate hair stylist. 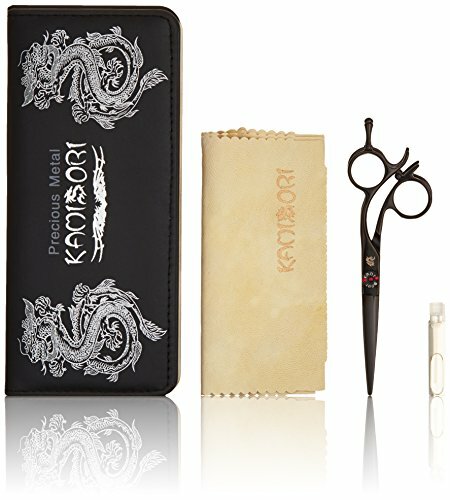 If you haven’t try until now some Japanese hair cutting shears, maybe it’s time to do it with the Saki Katana Japanese Hair Scissors Set and decide for yourself it they are worth it or not. 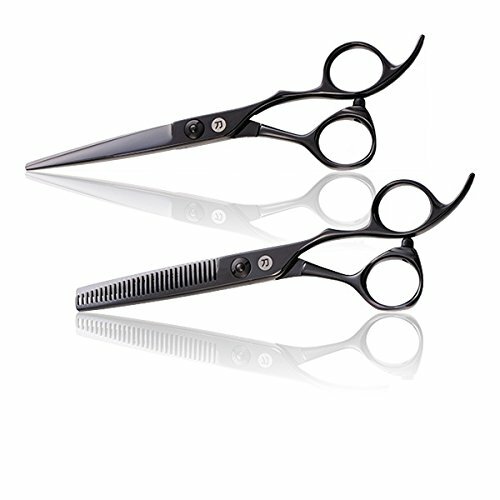 The set of shears is handmade and build with Japanese stainless steel and a thick coating of black titanium, which makes them not only long lasting, but also very elegant looking. The shears are made to last for a very long time. They feature a convex edge and triple-honed blade which gives you accuracy when cutting. The offset, very long crane handle lets you cut for an entire day without feeling your hand tired, with great comfort. The pressure is minimum, no matter the hair styling. The shears have a minimalist design and are very sharp. The texturizer is great when you go through the thickest hair and don’t collect hair. The set is highly versatile and fits so many types of hair cutting. The shears are the best choice for the blunt, wet and dry cutting just as well. You can use them for layering and cutting big time, either you are a beginner or a professional already. The ring size is adjustable for the perfect fit and great support when cutting. As they present so many great things, we’d say you’d have to be very picky until you find this set of shears some things that need improvement. So far, we haven’t found any cons.